The Cottage Pommeraie Champagne is for 4 people. REIMS 20 km, 120 km from Paris. One hour from Disneyland Paris. Restored with quality in mind design. Beautiful room overlooking a terrace and a garden bordered by a small stream, barbecue garden, large kitchen, bathroom, toilet. On the ground floor to the 1st floor a landing leading to 2 bedrooms with washbasin. timber, ponds for trout fishing, 4 golf courses nearby. Vineyards, champagne opportunities to buy at the winery-récoltant.Visites cellars of Champagne: Lanson, Taittinger, Pommery, Ruinart.Beautiful Heritage Cultural Heritage by UNESCO: the Gothic Cathedral and Basilica or were crowned kings of France, Villas Art Deco, Romanesque churches. Places of Memory of the War of 1914-1918.Chemin deDames.Balades walking and cycling. 2017 is the year to come in Champagne : many cultural events ..
A charming rural retreat with the most hospitable owners. We booked La Pommeraie with rural relaxation in mind and we were not disappointed. The cottage has a charming garden in which to spend time reading and enjoying the sights and sounds of nature. There are lovely walks on the doorstep amidst beautiful Champagne countryside. The bonus was the delightful owners Elisabeth and Claude who were extremely welcoming and helpful. Their advice was much appreciated as was the pool in their next door garden! They take great pride in making the stay of their guests as memorable as possible and nothing is too much trouble for them. There are many interesting towns and villages in the vicinity to be visited and it is an ideal destination for Champagne lovers. Reims is not to be missed. For those with an interest in history, there is much to discover about the First and Second World wars. All in all, a memorable holiday! A little bit of heaven in the beautiful French countryside. We loved every minute of our stay. Nous avons beaucoup apprécié votre dynamisme, votre gaité votre générosité. The Blondets are wonderful people who welcomed us and made our stay very enjoyable. As we were visiting American WWI battlefields, it was in the perfect location. Hope to visit again and will recommend to our friends. We stayed for a week in this stunningly beautiful cottage. It is everything you see in the photographs and more. The grounds are amazing: lush, flowered, with trees that I've never seen, all surrounding the grounds which are extensive. The cottage was so comfortable; one very large bedroom, and the other perfectly sized for two. The kitchen, although limited, is enough for meals and all the necessary basics. The main living area is relaxed and well appointed; all in the style fitting to a charming, country cottage. The pool, which is across the drive in the owner's gorgeous yard, is simply fabulous and adds a real vacation/spa experience to one's stay. And last but not least, the owners; Elisabeth-Marie & Claude are two of the loveliest people you could hope to meet. They were helpful with all our needs, and we all wished we'd had more time to just spend with them. The area of Ventelay, and the surrounding villages are a walk back in time, and if you appreciate true beauty and historic villages, this area is a must. This cottage and the surroundings are special in every way. 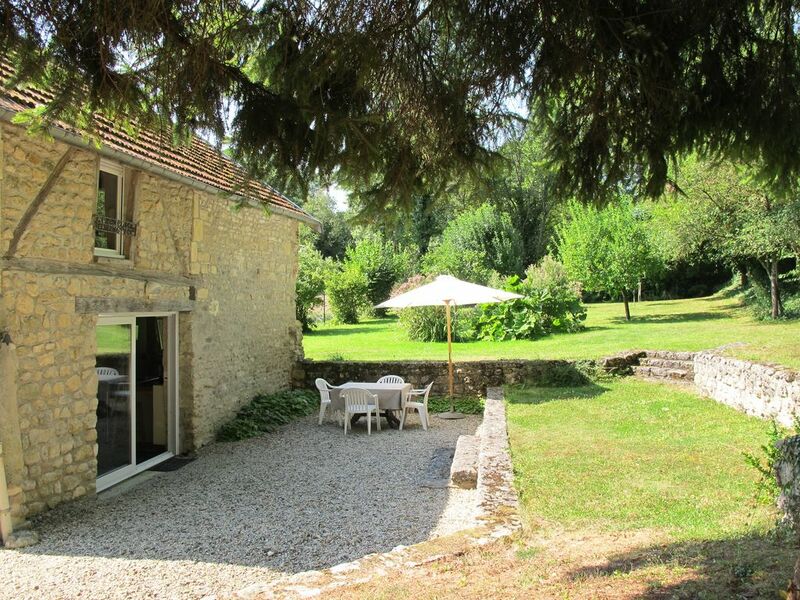 The Cottage LA POMMERAIE is situated in Marne 20 km from Reims and 12O miles from Paris, in an authentic countryside . The Gite la Pommeraie is situated between 2 villages : Ventelay and Bouvancourt on the tour of Champagne. View the 12 century Romanesque churches. Numerous trails: hiking, cycling, horse riders. 3 golf courses nearby. A pond for trout fishing is at 1000 meters of Gite La Pommeraie. Tennis 3 km from the village of Roucy (Aisne).